It’s tough enough in a campaign when you’re trying to reach the finish line and the other side is lobbing criticisms your way every day. It’s even tougher when your own team tosses a rock your way. That’s what is happening in the Virginia race for governor. GOP candidate Ken Cuccinelli is hearing it from state Republicans who fear his campaign has gotten off track; that he hasn’t pressed an economic message that Virginia voters would warmly welcome. “I wish I could be more hopeful than I am right now, but right now, it just does not look that good for our party going into November,” said Prince William County Board of Supervisors Chairman Corey Stewart, a conservative Republican who focuses on economic issues in his growing county. Stewart said the federal shutdown has soured citizens but the major candidates for governor -– including Cuccinelli -– are focusing on negative ads and attacks. “There’s a lot of negativity, a lot of attack ads,” Stewart told News4 Monday afternoon. “I don’t think they’re working. I think they’re backfiring, and that is not good news for Ken, unfortunately, in November. Both Stewart and former seven-term Republican congressman Tom Davis of Fairfax were quoted prominently in a Washington Post story detailing Cuccinelli’s woes with his own party. Davis, in a separate interview with News4, said statewide conservatives need to learn that Virginia is changing, not just in northern Virginia but in growing urban areas like the Richmond suburbs that once were determinedly Republican. “The [GOP] party has got to recognize times change and running a race that might have been successful 15 years ago doesn’t necessarily work in these times,” Davis said. Davis noted that northern Virginia now accounts for about one-third of the statewide vote and its share is growing. In response to The Post story, a Cuccinelli strategist brushed aside the intraparty criticism. "It's uncommon but not unheard of ... to attack a campaign before it's over. It ain't over yet,” said Chris LaCivita. “We won't concede and shame on those who do." 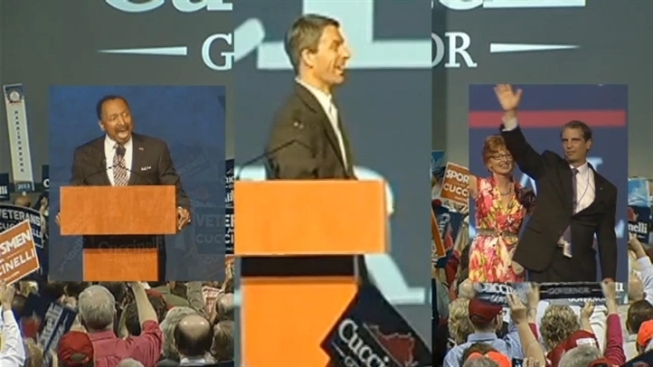 Cuccinelli and McAuliffe have one final, face-to-face debate. It’s set for next week, Oct. 24, at Virginia Tech in Blacksburg.